Starting now, the Cal Men’s Swimming and Diving begins their swim toward the 2014 NCAA Swimming and Diving title. Cal men’s swimming and diving team may not have the star power of their women’s counterparts in Berkeley, but they are also a favorite to compete for the NCAA title. Like the Cal women, the men are also entering the NCAA’s as Pac-12 champions. Of course, a NCAA team championship means so much more than the Pac-12 title. The Golden Bears are going for their 5th team title in school history, and their 3rd one in 4 years (Michigan took the title over the runner-up Bears last year). The Bears certainly have many members on the team who have the experiences winning the team title. With 16 swimmers, the Bears bring one of the largest group of swimmers to this week’s NCAA Championships, taking place in Austin, Texas. Cal is considered to be in a group of 4 favorites with Florida, Michigan, and host Texas. Day 1 prelims live stream: here. All the prelim sessions and tonight’s final are streamed live from TexasSports.com. ESPN3 will have live coverage for Friday and Saturday night’s finals. ESPNU will show the tape delayed coverage (action cut down to 90 minutes) at 8 p.m. ET on Wednesday, April 9. While the evening’s finals are the exciting races where individual winners are crowned, the team championship is won or lost during the prelim. Based on their times in the prelim, finalists for the A and B finals (each consists of 8 swimmers each) are determine. On rare occasion, there is a “swim off” for participants that post the same qualifying time in the morning for the final spot. It should go without saying, but points are not awarded for finalists who are disqualified (DQ’ed, typically for a false start or illegal turn). Leading the Bears are two individual champions from 2012 – senior Marcin Tarczynski (200 individual medley) and junior Will Hamilton (200 butterfly) – plus four members (senior Shayne Fleming, juniors Seth Stubblefield and Fabio Gimondi, sophomore Tyler Messerschmidt) of NCAA championship relays in 2012. Additionally, Cal features standout sophomores Josh Prenot(2013 Pac-12 Newcomer of the Year, two-time 400 IM conference champ) and Jacob Pebley (third at the 2013 NCAAs in the 200 backstroke), plus star freshman Ryan Murphy, 2014 Pac-12 champion in the 100 and 200 back (school record 1:39.21). The Bears were also the 2014 league champions in the 200 free relay (1:16.67) behind the swims of Messerschmidt, Murphy, senior Tony Cox and Stubblefied. The Bears does return a lot of guys from last year, but are missing a big one in the since graduated Tom Shields. The best bet for an individual title is perhaps freshman Ryan Murphy. Murphy is basically a Missy Franklin-lite in that he has already accomplished plenty on the national stage prior to coming to Cal. The Bears are serious threat in every relays, however, where the points are doubled. Does it feel like it’s way too soon to be seeing Murphy’s name on this list? This is the first time the word “value” really comes into play. Individually, Murphy should score somewhere between 40-50 points for the Bears this weekend, and he’ll probably be on 2-3 relays that will be in the running for NCAA titles. He has to be the favorite in what could be the fastest 200 backstroke field in history (Murphy, teDuits, Conger, Ress, Pebley, Sean Lehane, and David Nolan could all be under 1:40), and should be top 3 in the 100 back, as well. But… individual points aside, Cal could easily cover for Murphy if he happened to leave the program tomorrow. On nearly any other team, Murphy would be a massive difference maker. Cal, however, has three other guys who could step into his backstroke relay spots (Cox, Pebley, Tarczynski), and they really don’t need him on any of the three freestyle relays; Messerschmidt, Stubblefield, Cox, Gimondi, Fleming, and Tarczynski would cover the two shorter relays, while Hamilton, Bagshaw, Hinshaw, Williams, and Gutierrez could all fill the 800. This isn’t a knock against Murphy; he’ll be great for the Bears this week. It just shows you how loaded Cal is in a number of different events. I’m going to rave about the importance of Tyler Messerschmidt in part II of this article, but the addition of Katis put Cal in position to compete for their third NCAA title in four years. Katis competed for Harvard for two years, earning an NCAA appearance a year ago before coming down with a case of scarlet fever just before the meet (luckily, that didn’t kill his ability to pull off some card tricks for us). After a decent summer, he looked into transferring to a bigger program this fall, ultimately settling on Cal in what has been a match made in heaven. With the graduation of perennial All-American Trevor Hoyt, the Bears were in desperate need of a go-to breaststroker. For a while, it looked like they were going to use the platoon of Ryan Studebaker and Josh Prenot (who has a busy enough schedule as it is). Katis gives the big hitter the Bears needed to stay in the top three in the medleys, and should also be good for a pair of second swims individually. Unlike the women’s swimming last week where it was easy to say that Georgia would likely win with Cal being the most likely to challenge them (turned out ‘Furd was 2nd), there is less of a consensus for the men’s championships. The Texas men scored 25 diving points at NCAA’s last year with two divers. With four this year, and both of those guys from last year returning, the Longhorns have a chance of as much as quadrupling those points. We’ll err to the more conservative side and count them for about 75 points. That puts them right in Cal’s range as far as chasing the top two, Michigan and Florida. Last year, Texas had some guys with huge drops from their previous season-bests, but there were many other guys who either just matched their in-season bests or who fell way off of them. It was a mix of results, a mix that left them with an overall positive, but it wasn’t just a total jump. We can say with certainty that Texas will easily outscore the 86 relay points they’re seeded for. They’ll get a 60-75 point bump off of those relays alone. With another 20-30 points, from net individual improvements, that still leaves Texas with a hole that will have to be made up by Florida and Michigan falling off of their seeds, plus Cal not doing the same as Texas. This season feels a little differently than last season did for Michigan. They still had a very good NCAA Championship meet, but they haven’t had quite the same week-after-week-after-week success as they did in the run up to the national championship last season. Michigan’s highest seeded 50 freestyler, Bruno Ortiz, sits 29th coming in. He’s also their highest-seeded 100 freestyler in 16th place. It just feels like the Wolverines might be one sprinter short; one deBorde, one Messerschmidt, one Zack Turk short of repeating as champions. Whereas last year, they just seemed to have one replacement over another all day long in the sprints, this year they don’t feel that way. But if those guys from the 800 free relay, like Michael Wynalda, can come down into great 50?s and 100 freestyles, then the Wolverines are in the hunt. First, let’s talk about shaving. Yes, several of the Florida men were sporting beards at SEC’s. We’ve seen this “facial hair means no shave” out of the SEC before, and it’s backfired. We’re not sports psychologists, but maybe there’s too much pressure of trying to repeat those performances after the shave comes. Not shaving can’t be confused with not tapering or resting, and so we’re going to take the swims at face value, and presume that Florida was not as unrested as their facial hair might have implied at SEC’s. 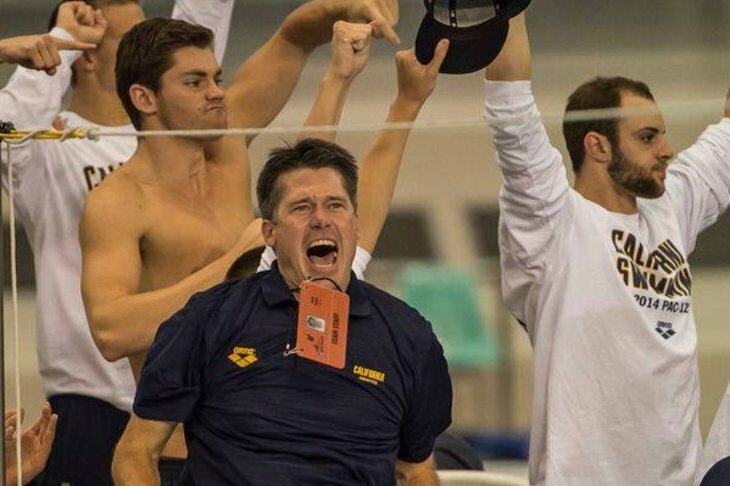 And at face value – the Florida men swam fantastic. They broke school records, they broke conference records, and Brad deBorde proved he’s one of the top two-or-three sprinters in the NCAA right now. They’ve also got a lot of individual swimmers qualified – 14 – which is second only to Cal and Texas. That’s where Florida’s positioned themselves. They’ve got the most seeded points, and they’ve got a deep team going to NCAA’s. For Florida to win, the easiest way will be for Pawel Werner to score the 20-plus points individually that he’s capable of (he’s not seeded to score any). That will give them some serious cushion. With Messerschmidt swimming well, and freshman Ryan Murphy proving that he’s much more than just a great backstroker and butterflier, Cal tops the Top 25 right now, 24 hours from the start of the meet. Of the four contenders for the team title, on paper we’ve got Cal having the best relays, and that’s a huge advantage. It’s especially a huge advantage when you consider they’re tied for the most individual qualifiers. In a battle like this, that’s the sort of comfort that should play huge. But for this to happen, Murphy needs to be in the A-Final in his 200 IM; Messerschmidt needs to be in the A-Final in both of his sprint events; Tarczynski needs to be in the A Final in all three events; Jeremy Bagshaw needs to sit in the top 8 in the 500 and 1650 freestyles. There’s just a ton of room for Cal to move up here, and they historically take advantage of those opportunities. So the Golden Bears appear to have a great shot at winning the 2014 NCAA Team Championships in a field without a clear winner. The Bears have the track record of being able to peak this week and shedding a lot of time from the psych sheet. Without a lot of swimmers considered to be favorites to win individual events (but with better chances on the relays), the Bears will likely have to win this championship in the prelims. It would be very interesting to see how many Golden Bears can find their way into the A and B Finals each night and how that compare with Florida, Michigan, and Texas. Texas does have a big edge in having lots of divers who will score, but Florida and Michigan are the true threat based on the time they have posted so far. Florid and Michigan are only have 14 and 13 swimmers qualified, however. More importantly, they also have fewer swimmers competing in fewer events to make it to a scoring position. I will try to update this post with today’s prelim result and use the post from the night before as an open thread for the next day’s prelim.